Skate Cross Station Progression #2 | Ice Hockey Systems Inc. This is a step up from the first skate cross progression. This adds a couple more cones so the players have to make sharper turns around each cone and stay engaged for a little bit longer. The fundamentals of the drill don't change. 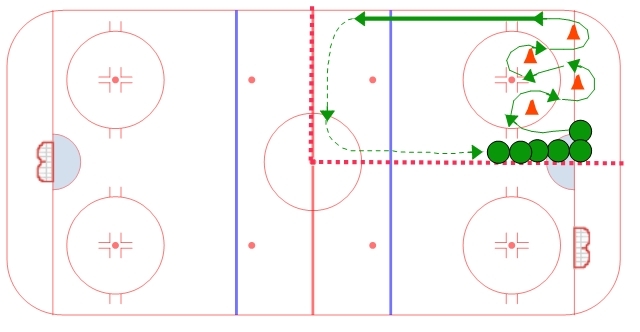 Players should work on good control turns and then a couple of good strides before the next cone. After the last cone the players should use full length strides to get to top speed by the blue line.